"China's strategy of opening-up to our industry and opening-up to innovation will benefit Chinese patients and also enable companies like us to keep investing in China." In recent years, especially from five years ago, Chinese regulators have been streamlining and accelerating new drug approvals, with efforts such as increasing the head count of staff for new drug reviews and speeding up approvals for drugs in urgent clinical need or for treating rare diseases. At the recently closed China Development Forum 2019, Wang Ping, director general of the department of drug registration under the National Medical Products Administration, revealed that China approved 48 new medicines in 2018, and reduced the approval period by a year. "Now China's regulatory timelines are at the same level of what we see in the United States or in Europe," Narasimhan said, adding that Novartis got nine new medicines approved in China in the past two years alone, at a pace faster than ever. 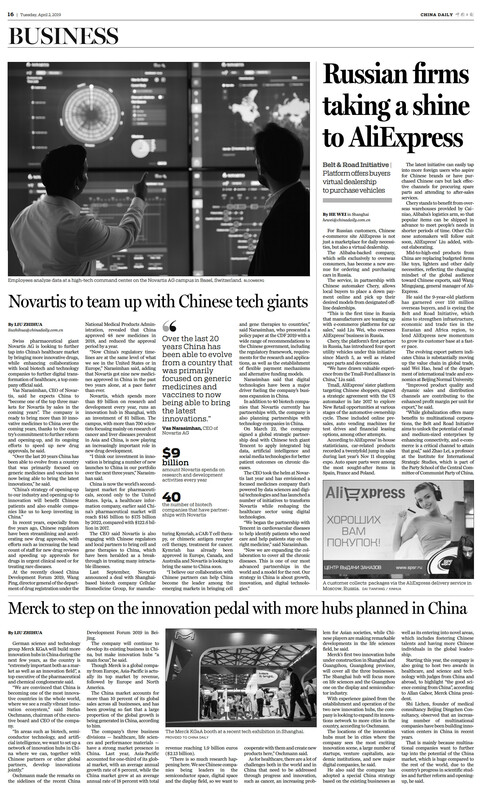 Novartis, which spends more than $9 billion on research and development every year, runs an innovation hub in Shanghai, with an investment of $1 billion. The campus, with more than 700 scientists focusing mainly on research of cancer and liver diseases prevalent in Asia and China, is now playing an increasingly important role in new drug development. "I think our investment in innovation is bringing a number of new launches to China in our portfolio over the next three years," Narasimhan said. China is now the world's second-largest market for pharmaceuticals, second only to the United States. Iqvia, a healthcare information company, earlier said China's pharmaceutical market will reach $145 billion to $175 billion by 2022, compared with $122.6 billion in 2017. The CEO said Novartis is also engaging with Chinese regulators and local partners to bring cell and gene therapies to China, which have been heralded as a breakthrough in treating many intractable illnesses. Last September, Novartis announced a deal with Shanghai-based biotech company Cellular Biomedicine Group, for manufacturing Kymriah, a CAR-T cell therapy, or chimeric antigen receptor cell therapy, treatment for cancer. Kymriah has already been approved in Europe, Canada, and Australia and Novartis is looking to bring the same to China soon. 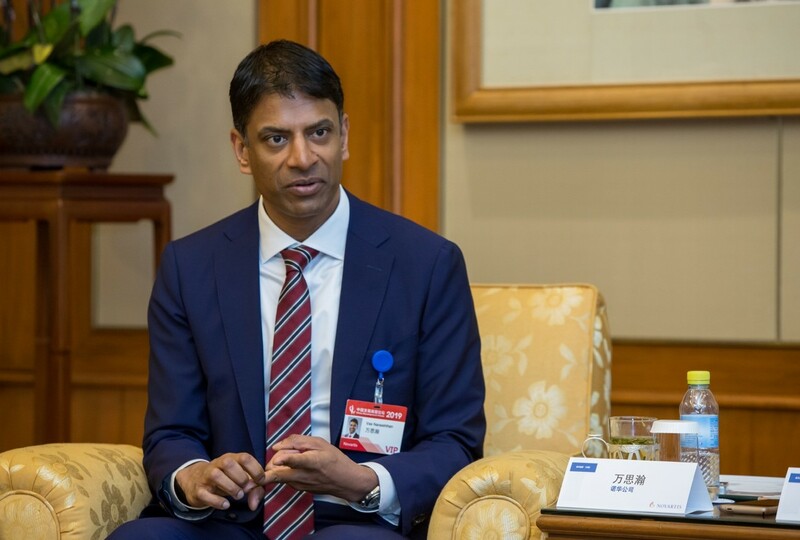 "I believe our collaboration with Chinese partners can help China become the leader among the emerging markets in bringing cell and gene therapies to countries," said Narasimhan, who presented a policy paper at the CDF 2019 with a wide range of recommendations to the Chinese government, including the regulatory framework, requirements for the research and applications, as well as the establishment of flexible payment mechanisms and alternative funding models. Narasimhan said that digital technologies have been a major driver fueling the company's business expansion in China. In addition to 40 biotech companies that Novartis currently has partnerships with, the company is also planning partnerships with technology companies in China. On March 22, the company signed a global strategic partnership deal with Chinese tech giant Tencent to apply integrated big data, artificial intelligence and social media technologies for better patient outcomes on chronic diseases. The CEO took the helm at Novartis last year and has envisioned a focused medicines company that's powered by data sciences and digital technologies and has launched a number of initiatives to transform Novartis while reshaping the healthcare sector using digital technologies. "We began the partnership with Tencent in cardiovascular diseases to help identify patients who need care and help patients stay on the right medicine," said Narasimhan. "Now we are expanding the collaboration to cover all the chronic diseases. This is one of our most advanced partnerships in the world and a model for the rest. Our strategy in China is about growth, innovation, and digital technologies."